Behold the latest discovery from James C. Christensen’s Saints and Angels collection, a series he attributes to his alter-ego, an obscure Flemish painter known as The Master of the Enoch Altarpiece. The subject of Saint with White Sleeves does not appear to be a specific saint, and the model for this striking portrait was likely one of the Master’s patrons. It was customary at the time for the wealthy to request that their portraits incorporate characteristics of saints or angels. 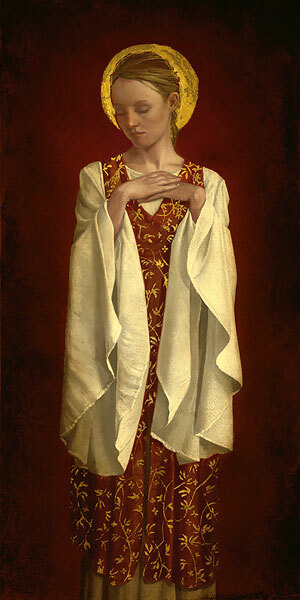 In Saint with White Sleeves, the halo suggests a saint, yet the white sleeves hint at angel’s wings.